Before reading the title of this post, I'm willing to bet that you never thought to yourself "What I'm missing in my life are some amazing mashed potato sculptures." Well, we here at Toons are dedicated to bring you exactly the things that you didn't realize you wanted. Throughout this post, you will find yourself enthralled at the majesty presented by the artists. At times you will find your hunger growing. And at other times, you may find yourself feeling a little....uncomfortable. That's normal. Art is meant to invoke these emotions. Without further ado, we bring to you the Best of the Best of Mashed Potato Sculptures! This piece was found very early in my Google search. I'm pretty sure it's a swan. Or a turkey. It's definitely a bird of some sort. Unless it's a cup holder. Either way, it's genius. 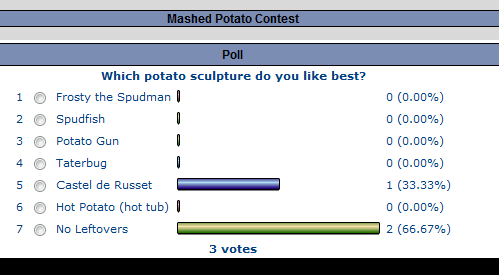 From its name to its curious little face, there's no questioning how it had such a commanding lead in the prestigious Mashed Potato Contest being held in the forums of AmericanGlassGuild.com. That many purveyors of fine food art can't be wrong. TakoyakiBall of DeviantArt struck golden russett gold with this beauty. With a few strokes of adept artistic know-how, what was once a mound of starchy deliciousness became this masterful mix of playful fun. The shame is that, given the popularity of cats, T-Ball very likely has to deal with many accusations of being a sell out. But I don't believe that for one minute. In the world of Mash Potato Sculptures, starving artists simply don't exist. First off, I know what you're thinking and, to be honest, I was hesitant to post this one. 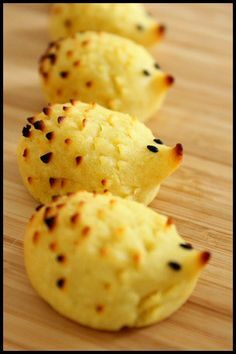 Even though technically, these are not mashed potato sculptures, the minimalist artist from pinterest, KenyaLovejwlry, really stuck a cord with this set of triplet potato hedgehogs. There's a little-known but growing underground movement in the potato art world right now and KenyaLovejwlry is leading this minimalist charge. Every generation has an artist that transcends the medium in which they work. The artist that breaks the chains, so to speak, to explore areas which, to that point seemed unapproachable in the past. The artist who created this masterpiece chooses to, at this time, remain anonymous, however his - or her - style is unmistakable and can be found at galleryhip.com. A keen eye can see how they use so many differenct materials in addition to mashed potatoes to create something unmistakably different. In this piece, which seems to be a sculpture of Mt. Vesuvius just prior to eruption, utilizes the perfect combination of mashed potatoes, butter and chives. Of course, if you're not a student of the craft, you would may miss the expert use of cauliflower and roasted color that add a bold combination of textures and colors that not only add character and style, but would make your grandmother take you out of her will in the process. Brian was often told not to play with his food. For ToonsShow.com, however, he is willing to break that strongly entwined programming in the name of journalistic integrity and art.